In this fully revised and expanded third edition of the bestselling Reciprocal Teaching at Work, Lori D. Oczkus provides both tried-and-true and fresh solutions for teaching reading comprehension. Reciprocal teaching is a scaffolded discussion technique that builds on the Fab Four strategies that good readers use to understand text: predicting, questioning, clarifying, and summarizing. More than 40 new and updated step-by-step lessons and minilessons that reflect current thinking and best practice. Dozens of rich suggestions for diving into informational texts. Updated research and relevant results that show the effectiveness of reciprocal teaching. Creative and targeted tips that capitalize on the specific benefits of whole-class settings, guided reading groups, and literature circles. Ideas for differentiating instruction for struggling readers and English language learners. New and newly designed support materials, including reproducibles, posters, bookmarks, and a lesson planning menu. With a wealth of ideas to get you started—and keep you going—this is the all-inclusive resource you need to help students become active, engaged, and independent readers who truly comprehend what they read. In this new video based on her best-selling book, Reciprocal Teaching At Work, literary consultant Lori Oczkus visits three schools to demonstrate multiple techniques in whole class and small group settings while working closely with teachers across several grade levels. The program is available on both the ASCD Streaming video platform and DVD. "Literacy coach and author Lori Oczkus knows how to take the best of what works from long-established research and showcase it to make teaching and learning more effective, engaging, and enjoyable. In her latest edition of Reciprocal Teaching at Work, she demonstrates how to scaffold instruction so that all K–12 students can benefit from reciprocal teaching techniques, what she calls the "Fab Four"—predicting, questioning, clarifying, and summarizing—in whole-group, guided reading, and book club settings, for both fiction and informational texts. In clearly delineated lessons and minilessons, Lori deftly shares how to support students' learning, including English language learners and students who struggle, so they can successfully apply and monitor those four discussion strategies—as well as troubleshoot problems—to yield significant progress in their reading comprehension. Filled with great practical ideas, this gem of a book is a must-have for all literacy educators!" "Reciprocal teaching works to push students into deeper learning. There are decades of research on the impact of this instructional approach, and this book shows you how to implement and refine the practice such that all students succeed." "One of the great instructional research discoveries of the past three decades has been the efficacy of reciprocal teaching for improving student learning and reading comprehension. More than anyone, Lori Oczkus has explored practical ways for making reciprocal teaching an integral part of nearly any classroom setting. This current work by Lori represents the epitome of her work in translating reciprocal teaching research into practice. Readers will find this immensely readable book filled with strategies that can be easily implemented and that will improve student learning. If you are interested in improving your students' reading achievement, you need to read this book!" "In this new edition of Reciprocal Teaching at Work, Lori Oczkus offers new thinking while reinforcing the best practices that make her ideas timeless. Through these engaging lessons and smart instructional moves, you will empower your students to build the confidence and competence they need to become strong, independent readers." "On every page of this book, in every activity and plan, the voice of a gifted and empowering teacher inspires the reader. In a major revision of her classic work, Lori Oczkus engages the immediacy and demands of today's classrooms with the most robust constellation of strategies for teaching comprehension. She compellingly demonstrates how the "Fab Four" are engaged across the grades, and she powerfully scaffolds, supports, and reassures teachers in their efforts to incorporate reciprocal teaching across a broad communication, textual, and digital terrain." "Reciprocal Teaching at Work is a must-have resource for any teacher, literacy coach, staff developer, and administrator seeking to accelerate student learning, promote equity, and close the opportunity gap! The updated and expanded third edition is jam-packed with fresh new lessons, new research, new reproducibles, and an easy-to-use online study guide for facilitating professional development. Whether you are new to reciprocal teaching or a veteran, try Lori's teacher-friendly, classroom-tested ideas with students of all ages, including English language learners and intervention students, and watch reading achievement soar!" "Lori's first book introduced me to reciprocal teaching 15 years ago. I was excited with her second edition for all the new ideas and minilessons. I am still learning new information in this third edition. I love the 40 new minilessons, the current mentor text, the updated research, and so much more. Lori understands the challenges of teaching reading comprehension through her many hours in real classrooms. As a result, she keeps creating implement-ready tools that ALL teachers will want in their strategy toolbox." 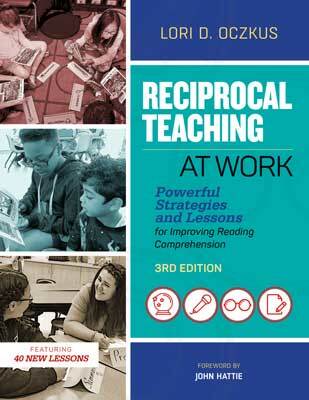 "Reciprocal Teaching at Work is a must-have for every teacher in every content area! Lori Oczkus provides clear, simple guidelines to foster rich academic conversations between students. Reciprocal teaching has revolutionized my teaching, and this new edition is full of great updates and new visuals! There is no shortage of fun either, with the Fab Four characters making each piece of the strategy memorable. I look forward to reading this book with my colleagues in a Professional Learning Community to align our language and spark a deeper comprehension across subjects and grade levels!" Lori D. Oczkus is a literacy coach, author, and popular speaker across the United States. Oczkus has extensive experience as a bilingual elementary teacher, intervention specialist working with struggling readers, staff developer, and literacy coach.